Recently I have come across a video floating around the internet of a man converting from Islam to Christianity with an absolutely farcical testimony. The entire premise of his argument was a comparison between the Christ Jesus and Muhammad on the basis of the Quran. Firstly, the whole notion of pitting Jesus against Muhammad for a Muslim is utterly stupid to begin with. Muslims believe Jesus and Muhammad came with the very same message that there is no deity but God, the One True God of Abraham. There is to be utterly no competition between the two. The video begins with the man, supposedly an ex-preacher, being asked by someone from a crowd, “Who is Jesus?” In order to answer this, the man says that he reads the entire Quran again. Honestly, did he do this in the presence of the crowd because that’s a lot of reading to do in a day, I am guessing with an entire horde of people before him? The man must read at the speed of Flash. Also, he says there are 6,666 Verses in the Quran. This is a myth created to scare off Christians with 666 being the Number of the Beast and all. The Quran, in reality, has 6,236 Verses in general barring the opening incantation of Bismillah for every chapter except for Surah at-Taubah for which we do not recite it. Counting the opening incantation there are 6,349 Verses. Still not 6,666. This really makes me doubt his status as an ex-Muslim. Moving on. The response to the question would have been simple for any learned Muslim. Jesus Christ is a Prophet, a human being inspired with the Revelation of the Gospel and the Wisdom of the Torah embedded in his heart from birth. He is also the Messiah, the Anointed King from the bloodline of David born to return before End Times to slay the Antichrist and establish God’s Righteous Dominion on Earth. This easy response does not quite come to him when asked so he needs to read all one-hundred and fourteen chapters of the Quran once again. What does he find? He finds that the name of Jesus is mentioned twenty-five times in the Book whereas the name of Muhammad is mentioned only four times. This makes him confused. Why? The Quran, as we believe as Muslims, is God speaking to Muhammad in direct speech addressing all of us, his followers, and relating to us, and him, the stories of the Prophets before him. If I were to be talking to Person A and relaying the biography of Person B to him, would not I mention the latter more than the former? Easier example, if I were to be narrating the story of Abraham Lincoln to my grandchildren would not the name of Abraham Lincoln be mentioned more in my speech to them than their own names? The argument that the name of Jesus is mentioned more times in the Quran than the name of Muhammad is asinine since it is God telling Muhammad the stories of Jesus and Moses and Abraham and a myriad of other prophets. Heck, the Pharaoh is mentioned more times in the Quran than Muhammad and Jesus combined. Let us do a count survey and address this more completely. Jesus is mentioned in the Quran twenty-five times, same as Adam. Muhammad is mentioned four times. Add those two together. Actually, add all three and you have Jesus, Adam and Muhammad mentioned a total of fifty-four times. The Pharaoh is mentioned seventy-four times. More than the names of three Archprophets of Islam. Does the above mean anything at all? Did this man just count the number of times people were mentioned in the Quran or did he actually read what the Quran had to say about them those number of times they were mentioned? Did he actually read what the Quran had to say about Jesus the twenty-five times his name was mentioned? Did he take note of the Verses saying explicitly that Jesus Christ is no more than an inspired human being? The name of Moses is mentioned one-hundred and thirty-six times in the Quran. Does this mean Moses is God? Thirty seconds into the video and this man has already made a staggering mountain of a mistake. Next, he mentions that the only woman mentioned by name in the Quran is Mary. This is true. Though she is not the only woman mentioned in the Quran but she is the only one mentioned by name. Mary is, of course, no doubt, a special figure in the theology of Islam. However, this importance is explained by Islam itself that her significance is by virtue of her mother’s supplications and her own piety and pureness. It does not anyhow prove that Jesus is God. Also, he mentions that the name of the third chapter of the Quran is “Family of Maryam.” False. The name of the third chapter of the Quran is “Family of Amram,” Amram, or Imran as he is called in Arabic, being the father of Moses, Aaron and Miriam, ancestor of the bloodline of Joachim, the husband of Anne and father of Mary. Around the one-minute and thirteen-second mark of the video, he mentions that Mary was born without Original Sin. Islam does not believe in the concept of Original Sin, hence all creatures, inherently, are born, in Islam, without Original Sin. Where he gets the idea of Original Sin in Islam from is beyond me. This is Verse 23 of the fiftieth chapter of the Quran. Does not sound like the Assumption to me. Does it to you? Next, the man goes on to cite titles of Jesus mentioned in the Quran. Firstly, the Quran calls him the Word of God. Yes, this is true. The Quran asserts that Jesus is the Word of God made flesh. However, this does not mean Jesus, himself, is the Eternal Word of God. Rather, there are two ways to interpret this, both of which, the supposed preacher, conveniently misses out on. “Be!” is the Eternal Word of God through which he commands the spirit of God to become flesh and thus he is incarnated materially as the result of the Pronunciation of the Word. Thus, he is referred to as the Word made flesh. Another interpretation is that all the prophets were infallible manifestations of their message from God. 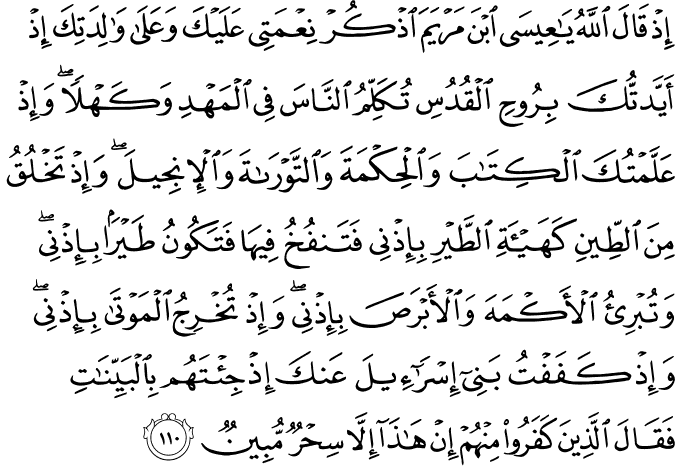 Regarding this, Aisha tells us that the Prophet Muhammad was the walking Quran, the Quran being the Word of God and thus Muhammad being the Word in flesh. Similarly, Jesus, too, came with a Message that was the Word of God, a Spiritual Path and a Law, and he followed It to the letter thus himself being the Word made flesh. Neither interpretations prove that Jesus is God. O People of the Book! Do not exceed the limits in your religion, nor say of God aught but the truth. Christ Jesus, son of Mary, was a Messenger of Allah and His Word which He bestowed on Mary and a spirit created by Him; so believe in Allah and His Messengers. Say not: “Three!” Cease! It is better for you. For God is the only deity, glory be to Him. Far Exalted is He above having a son. To Him belongs all that is in the Heavens and all that is in the Earth. And God is All-Sufficient, Omnipotent. Finally, he mentions that the Quran calls Jesus the Messiah. Yes, of course. Muslims believe Jesus is the Messiah but not the Messiah as defined by Christianity but rather that defined by Judaism. O Jesus, son of Mary, remember My Favor on you and on your mother, when I strengthened you I with the Holy Spirit, you spoke to the people in the cradle and in maturity, and when I taught you the Book and the Wisdom of the Torah and the Gospel; and when you determined out of clay a thing like the form of a bird, by My Permission, then you breathed into it and it became a bird, by My Permission, and you healed the blind and the leprous, by My Permission; and when you brought forth the dead, by My Permission; and when I withheld the Children of Israel from you when you came to them with clear arguments, but those who disbelieved among them said: This is nothing but clear enchantment. All of this is self-explanatory. Jesus, according to the Quran, did not do miracles of his own accord but by the Favor that God bestowed upon him that allowed him to do all these. The man mentions that the Quran does not speak of any miracle by Muhammad. This is, once again, because the Quran is God talking to Muhammad so obviously God is not going to be telling him about himself when he has already witnessed the miracles that God has allowed him to do. This argument is ridiculous. 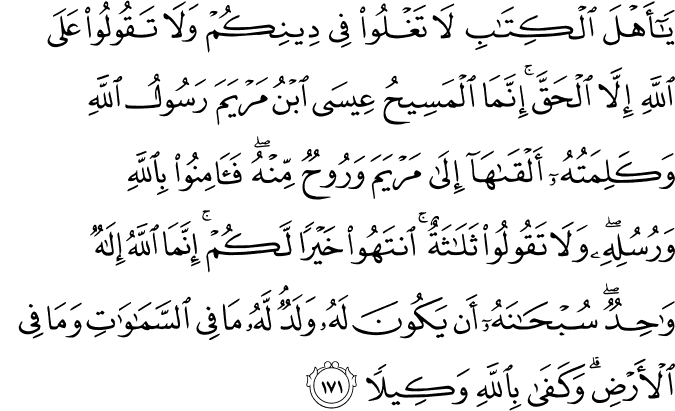 The man, in merely three minutes, has fallen into multitudes of errors in his understanding of the Quran and the Islamic personhood of Jesus. His testimony is thoroughly misguided and he must admit his ignorance and seek better comprehension of his beliefs. May God, Exalted is He, bless us all and protect us from misgivings. Ameen.